Oddly enough, the assembled dimensions of the T616 are not disclosed by the manufacturer. The running track however is a spacious 60” x 20” of length and width respectively. The Nautilus T616 has a folding option with SoftDrop Fold design that uses hydraulic shocks to gradually fold or unfold the treadmill at your will without running the risk of hurting you. Being light in weight and compact, the T616 ensures you can put the treadmill in your room and then tuck it away after use in order to save space when done. Transportation wheels at the bottom also make it easier to move the machine from one place to the next. The console of the Nautilus T616 is a high point for the treadmill with high definition DualTrack blue-backlit LCD display giving you two screens to track all your readings while also allowing you to control the various speeds and inclines to choose from. The console has 26 built in workout programs that give you a very vast variety of training options to choose between such as manual, quick goal, train, weight control, heart health, as well as interval and custom workouts. 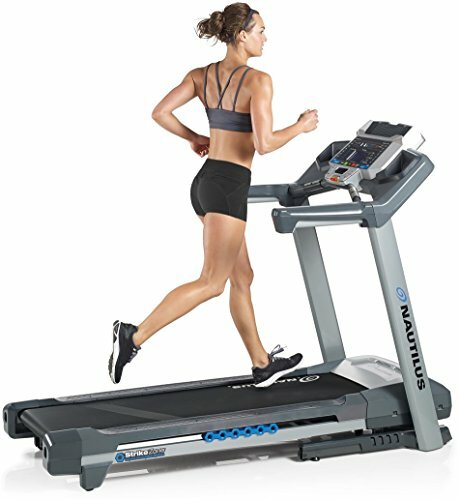 The speed of the treadmill ranges between 0 mph – 12 mph while the incline can be adjusted from anywhere between 0%-15%. 4 user profiles can be saved in the console with each profile having its readings updated and stored in order to keep you updated on every calorie your body burns. The T616 has MP3 compatibility allowing you to enjoy music entertainment as you work out by incorporating acoustic chamber speakers with a nice, full sound. Bluetooth connectivity pairs the Nautilus T616 to the Nautilus Connect, Nautilus Trainer, as well as MyFItnessApp from where you can download work out data. Nautilus Connect is a pretty spectacular performance tracking program that allows you to sync and analyze your individual workout data for advanced and easy goal tracking. This signifies that no reading of your progress will escape your eye if you sync your treadmill to these apps. In short, the console provides pretty much everything one would expect from a top-of-the-line treadmill with the only exclusion being a touchscreen and internet connectivity. But that isn’t a problem in itself because the console gives you all the relevant things you need in order to find your fitness glory. Other console accessories include two bottle holders and a 3 speed adjustable fan. The treadmill is durable and made of solid steel construction. It can support weight of up to 300 pounds which is relatively low compared to other treadmills that come at the similar price range. However 2.75 inch crown rollers provide a smooth, fluent, and consistent workout. StrikeZone cushioning on the running surface is made of 6 cells and each of these layers work in coordination with one another to absorb the maximum amount of impact from your strides which would help make it easy for your muscles, joints, and tendons to recover faster after your workout is over. A powerful 3.0 CHP motor provides sufficient amount of power to consistently operate the running track. It requires a standard 110v of power in order to operate. The high quality of the motor means that it is not noisy and you can easily listen to music on the Nautilus T616 without annoying anyone else in the house. If there is one noticeable con with the otherwise awesome Nautilus T616, it isn’t with the machine itself as much as it is with the warranty being offered by the manufacturer. Unlike most other treadmills that have a lifetime warranty on the frame, Nautilus offers a mere 10 year warranty on the frame and drive system, 2 years on electrical and mechanical parts, and 1 year for labor. Bluetooth connectivity to Nautilus apps as well as MyFitness App adds a lot more to the already staggering number of features offered by the T616. Good top speed and 15% incline targets core muscles of your body. MP3 compatibility makes music entertainment possible. The DualTrack display incorporates two screens but the display are too small which makes the console crowded and the readings difficult to read. With only a few shortcomings that barely take anything away from the treadmill, the Nautilus T616 is top end high quality on every level. With a console that offers practically every important feature imaginable, and a plethora of impressively high 26 workout options as well as app connectivity and MP3 support makes the T616 have a great case for your dollar. If you’re contemplating buying this treadmill, we seriously urge you to go do so. Top dollar pays for top quality and nothing else could hold more true for the Nautilus T616. Easily one of the best treadmill line in the entire Nautilus T series. Jam packed with lots of workout features, incline, and the added joys of music compatibility.